This simple-but-delicious Italian fish dish is called "pesce all'acqua pazza", or "fish in crazy water". Where exactly the name came from isn't clear, but it's one of the more delicious things you can make in less than 20 minutes on the stovetop. More importantly, it's tomato season, so the perfect time to make this. 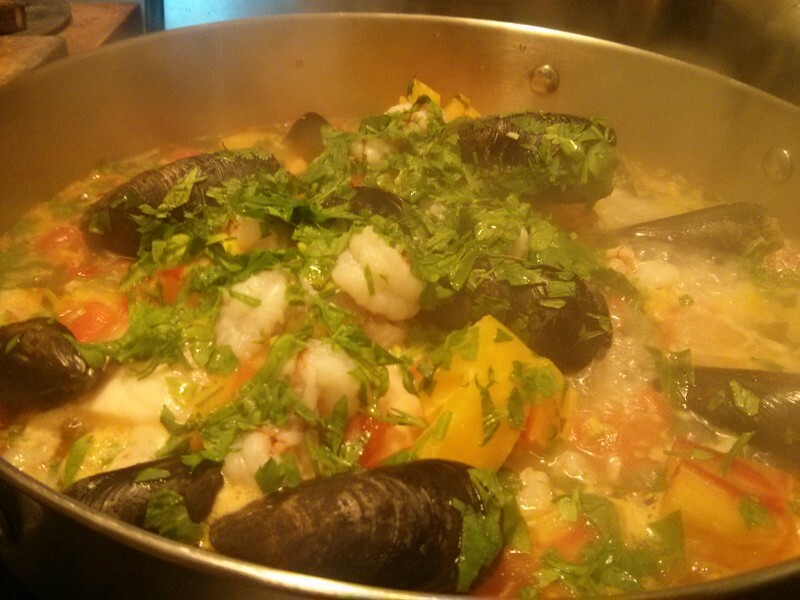 Like a lot of other traditional recipes, you'll find a bunch of variations on acqua pazza. This one works for me, but feel free to play with it. Toast or grill the bread. Put each slice in the bottom of a wide, shallow bowl. Heat the olive oil and garlic slices in a wide (12-14"), deep skillet for which you have a lid, using medium-high heat. When the garlic starts to sizzle and color, lay the fish filets on top. Let fry for 1 minute, then cover with the chopped tomatoes and their juice. Add the mussels, clams and/or shrimp if using, scattered evenly around the pan. Add the wine. Add enough water to make the contents of the pan a bit soupy: around 1/2" of liquid up the sides of the pan. Cover and reduce heat to medium. Cook for 10 to 15 minutes, or until the fish is done and any shellfish are open. Around 2-3 minutes before it's done, sprinkle with the chopped parsley so it has a little time to cook. Serve each diner a portion of fish on top of the toasted bread, and then spoon a bunch of the tomato-wine soup (and shellfish) over the top, until the bread is soaked. Serves two people as a one-dish meal, or four with other courses. Fish: most kinds of white-fleshed fish skinless filets or boned steaks will work with this: butterfish, halibut, rockfish, striped bass, etc. The recipe also works with sole, but you will need to shorten cooking times, and not do the shellfish because they take longer than the sole does to cook. Tuna and mahi-mahi are a bit strong-flavored for this recipe. Bread: use any white-flour unsliced real bread loaf, like a nice sourdough batard. Slice it about 1/2" thick and toast it for a few minutes. Trim slices as necessary to fill bowls.